Raising your own food is often considered a good way to cut down on costs, but is that always the case? I know my parents have sometimes remarked that it cost more in water to grow themselves a tomato than it would cost to simply buy one from the store. Often people start to raise chickens in an effort to save money on eggs, but does it really save you money? Not necessarily. So, how much do chickens cost, anyway? The answer is, it depends! There are some basic set prices that aren’t going to go away when you start raising chickens. The first price is the price of the bird. The two most common ways of obtaining chickens is buying chicks, or buying pullets (young birds just about to start laying). Chicks are going to be cheaper upfront, at about $1-5, however, they are more likely to die, and they also need a little bit of equipment to get started with them. They’ll need a heat lamp, small dishes, and a brooder. This doesn’t necessarily cost very much, and a cheap brooder can be made with odds and ends you have in the garage or around the house. If you aren’t interested in raising your own chicks, you may want to consider buying pullets. Pullets are young birds that will start laying soon. A reasonable price for pullets is $15-25 dollars per bird. Starting with pullets is a good way to start getting eggs immediately without having to wait for your chicks to grow up and reach laying age. If you go with pullets, you’ll need an outdoor coop ready immediately for them to move into. Coops can be as fancy or as simple as you want. You can pay hundreds of dollars for a pre-made coop, or you can easily cobble together your own with free materials. For some ideas on creating a chicken coop, check out 55 Best Chicken Coops for Practical People. If you have a rooster or a mixed age flock, you’ll want a non layer feed and to provide the laying hens with oyster shell. Around here oyster shell is about $8 for five pounds, but you can also get it a little cheaper as an add on item on Amazon. The amount of oyster shell they eat will vary based on how much calcium they need, but in general, the more they lay, the more calcium they need. My birds took several months to go through five pounds of oyster shell. Of course your birds will also need fresh water. Unless your birds are completely free range (which can be pricey to replace birds killed by predators), or in a tractor that’s moved every day, they are going to need bedding in their coop. The most common and easy to start with is straw. I’ve hard of people buying a bale of straw for $5, although for us in Oregon a bale was $14. When we had three birds a bale lasted forever, but when were up to twelve or more, I’d pick up a bale every month. However, if you have access to other carbon sources, you can use those as bedding. Wood chips make a nice deep litter in the coop, and often you can get those for free from tree trimmers, the electric company, or the city yard waste facility. If you have a lot of yard trimmings and a chipper you could even make your own free chicken bedding. Leaves also make a nice bedding, but you would need a way to store them so they stay dry all year. 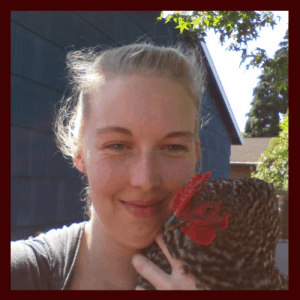 The total cost of keeping chickens is…. Let’s say you made a coop of materials you already had on hand, and you’re using dishes you found around the house for feed and water. To start a small 3 bird flock with $20 pullets will cost you $60 for the birds themselves, $15 for a bag of feed, $8 for oyster shell, and $10 for a bale of hay. You can take everything home for less than $100 dollars. Are chickens worth the cost? If your end goal is cheap eggs, keeping chickens might not necessarily be the best goal for you. However, the real plus side of keeping your own chickens is that the quality of the eggs you get is much better. If you supplement your chickens with any kitchen scraps, grass, or garden produce the eggs you get will taste much better and contain more nutrition than the cheapest eggs you can buy at the store. If you are currently buying egg free or organic eggs, you very well may save money by raising your own. Related: Will Raising Meat Chickens Save Money? Backyard chickens also generally have a much better quality of life than the hens that provide the majority of eggs in grocery stores. Plus, having chickens is fun! They also make nice pest control, and their droppings are very beneficial if you are growing any of your own food. If you have a rooster, you can hatch out your own replacement stock, or even extra birds for the table. Additionally, there are ways that you can get your feed costs down and reduce your reliance on purchased feed. For me the minimal extra cost of the eggs is worth knowing the birds that provided them are happy, plus the additional benefits of pest control, fertilization, and entertainment make chickens well worth the cost. 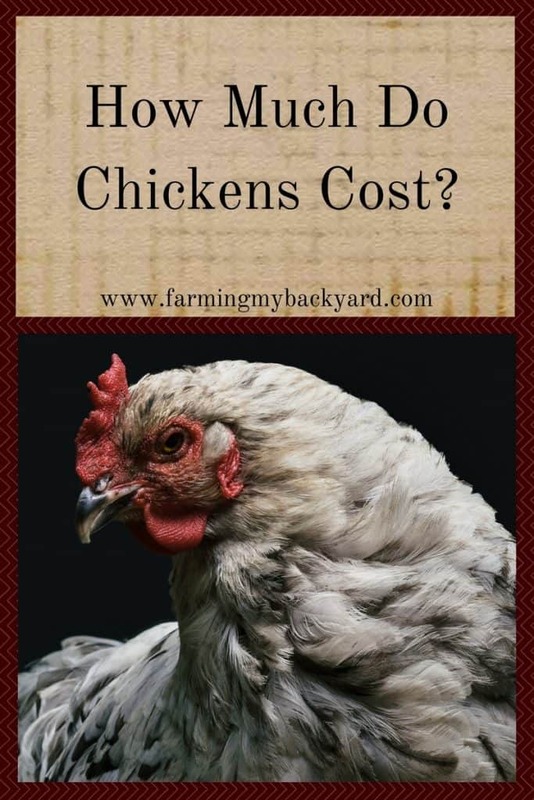 How much do your chickens cost? Is it worth it? Share in the comments below! Interesting article and probably captured the math that has been running around in my head. I never thought getting into chickens was a money saver; its the journey that I’m after. Thanks again. As an update, my coop is finished but other projects keep bumping the purchase of pullets down the list and now that winter is upon us, I think I’m looking at a spring start. I’m excited for you to get your birds this spring! Chickens are not an economical. They are our joy. The eggs taste so different than the supermarket brands. And the interaction with these creatures is so satisfying. They are far more intelligent than this city girl ever imagined. You have to spend the time and money to enjoy the benefits of chickens. I have my girls for my enjoyment. They make me smile and laugh. I got them at 2 days old. They are 4 months old now. They cost me only in feed. I took pallets apart to make their coop. They are happy and healthy Rhode Island reds. I have two now but want a rooster and a couple more girls lol. Thank you for your blog as this is all new to this 52 yr ols female. Chickens are great entertainment! I’m glad you are enjoying your flock.